The Heidolph Laborota 4001 Rotary Evaporator has a smooth and quiet motor, and quick operation features that make this rotavapor a breeze to use. This Heidolph rotary evaporator handles distillation volumes of between 50mL to 3L, with quick release glassware for modular set ups. This rotary evaporator comes with a cold trap configuration for the trapping of low boiling point solvents. The Laborota 4001 efficient rotavapor is compact yet covers most needs, with a motorized automated lift, a sparkless, brushless quiet motor and a rotation speed range of 0-270 RPM. The Heidolph Laborota 4001 Rotary Evaporator comes with a gliding heating bath, attached to the main body of the rotavapor, but with independent controls. The interior of this rotovaps heating bath is insulated to help maintain temperature, with a nonstick coating for easy clean up, and encapsulated elements to prevent scalding. The maximum temperature for the heating bath is 180°C for oil and 100°C for water. This rotary evaporator also features integrated vacuum control and a vacuum pump. Please note that the pump is regulated for 80 mbar, and covers a wide range of solvents but not all solvents. Be sure to check the solvents you’re working with for compatibility, we also have other dry vacuum pumps should you need something more robust. 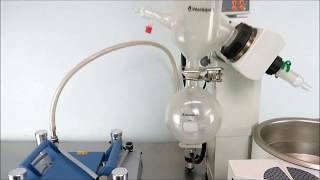 This Heidolph Laborota 4001 Rotary Evaporator has been tested by our service department. The Vacuum pump is regulated for 80mbar which is suitable for a wide range of solvents, but not all common solvents. Please be sure to check which solvents you're working with and what their evaporation rate is per vacuum. We have other dry vacuum pumps in stock should you need something more robust. All of our lab equipment comes backed with our standard warranty. Should you have any questions, please don't hesitate to contact us.